From natural disasters to other kinds of catastrophes, jewelers need to be prepared. North Americans have witnessed a variety of natural disasters in the past few years, from last year’s Hurricane Sandy in the northeastern United States to Oklahoma’s devastating tornadoes in May and catastrophic flooding in Canada’s Alberta province in June. Such events should trigger a desire in every jeweler — no matter how large or small — to create disaster preparedness and business continuity plans. View and listen to the 2013 Professional Development Seminar talk, “10 Tips for Catching & Keeping and Editor’s Attention,” by Michelle Bilodeau. The 2013 PDS took place at the SNAG conference in Toronto in May. The 3D revolution is bringing about changes to our world by spawning new start ups, innovative products, and jobs in new markets that did not exist a few years ago, as well as connecting people from different disciplines in ways that one could never imagine. This exciting technology creates opportunities that will reinvigorate our field. 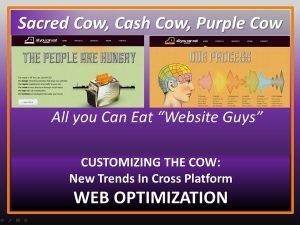 View and listen to the 2013 Professional Development Seminar talk, “Customizing the Cow: New Trends in Cross Platform Web Optimization,” by Justin Hartzman and Jeremy Poriah from All You Can Eat Website. The 2013 PDS took place at the SNAG conference in Toronto in May. Additional talks will be posted every week. I was first introduced to SNAG in graduate school in the mid-nineties and I have enjoyed the sharing and camaraderie of the metals community while learning so much about the craft. For a while I was the Technical Editor for SNAG News and it felt good to be part of the organization that helped inspire me in the arts. I felt that by joining the board, I would be able to contribute more to promoting our craft and SNAG.